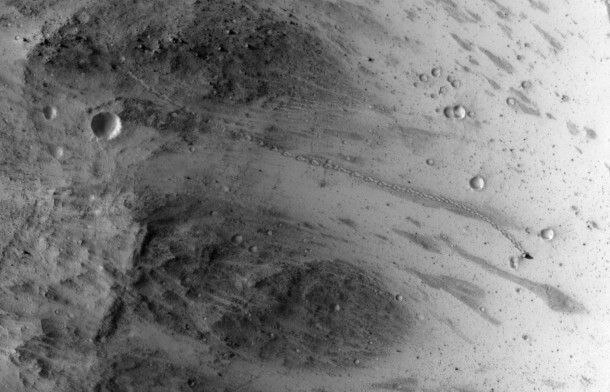 A track about one-third of a mile (500 meters) long on Mars shows where an irregularly shaped boulder careened downhill to its current upright position, seen in a July 3, 2014, image from the High Resolution Imaging Science Experiment (HiRISE) camera aboard NASA’s Mars Reconnaissance Orbiter. The shadow cast by the rock in mid-afternoon sunlight reveals it is about 20 feet (6 meters) tall. In the downward-looking image, the boulder is only about 11.5 feet (3.5 meters) wide. It happened to come to rest with its long dimension vertical. The trail it left on the slope has a pattern that suggests the boulder couldn’t roll smoothly or straight due to its shape. NASA’s Jet Propulsion Laboratory, a division of the California Institute of Technology, Pasadena, manages the Mars Reconnaissance Orbiter for NASA’s Science Mission Directorate in Washington. HiRISE, one of six science instruments on the orbiter, is operated by the University of Arizona, Tucson. The instrument was built by Ball Aerospace & Technologies Corp., Boulder, Colorado.